These Display Cabinets are Four Inches Taller Than Other Models! 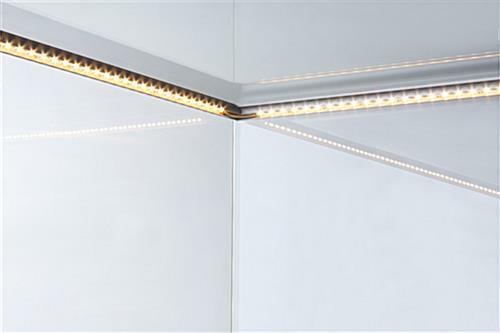 Built in LED Lighting Gives Soft Natural Light! 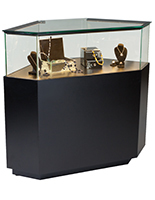 Order These Display Cabinets Online and Combine with Other Grace Tyler Displays for a Custom Retail Case Setup! 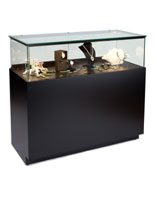 Each Grace Tyler retail case fits with others from the collection to create cohesive merchandising displays. 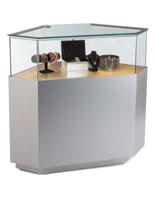 Impact resistant tempered glass counter is safe for use in high traffic environments. 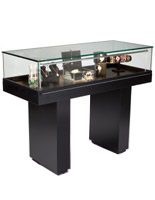 Glass-topped locking retail case ships fully assembled for convenience. 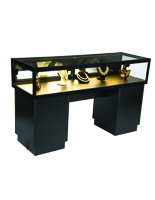 These display cabinets have a sturdy MDF base with rear locking storage cabinets and drawers. 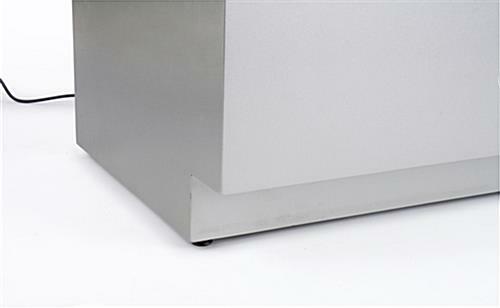 These retail case bases also feature a recessed toe-kick to reduce scuffing and have a stylish semi-gloss silver finish. 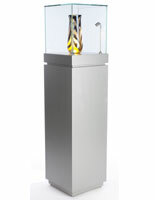 These retail merchandisers, jewelry display cabinets stand 42" high, four inches taller than other models. 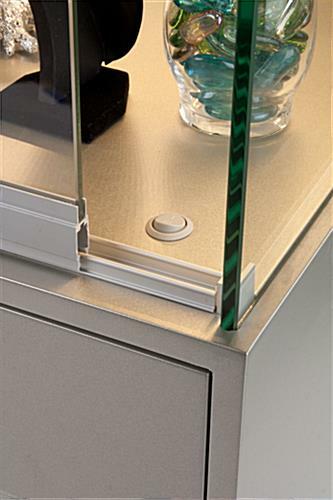 The glass countertops are made from impact and shatter-resistant tempered glass. 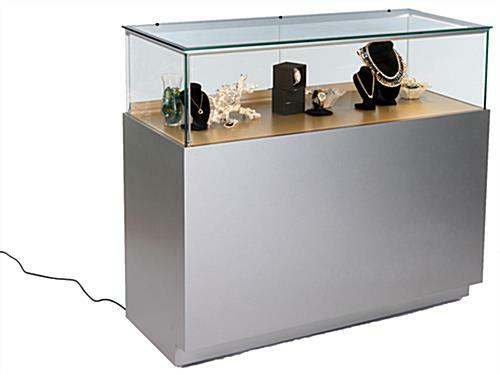 Energy efficient LED lights are built into these display cabinets, also known as jewelry counters, to provide soft and natural illumination for contents. 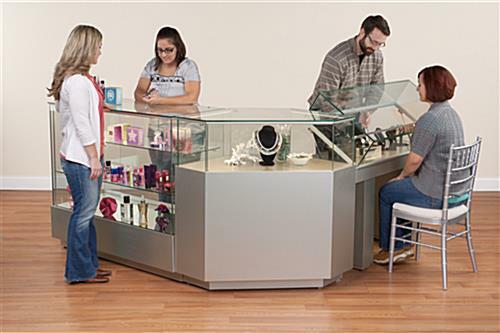 As part of the Grace Tyler collection of retail case store fixtures each retail showcase will coordinate perfectly with others from the same line. 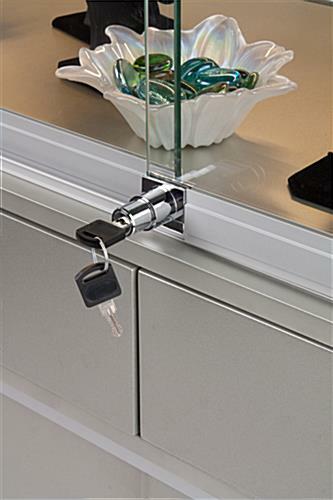 In addition to locking rear storage, these elegant jewelry displays, silver-finish display cabinets have sliding glass access doors in the back that also feature a secure plunger lock. 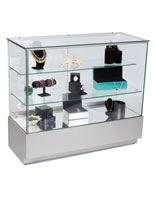 These Grace Tyler showcase enclosures are perfectly suited for any retail establishment, museum, gallery or even residence. 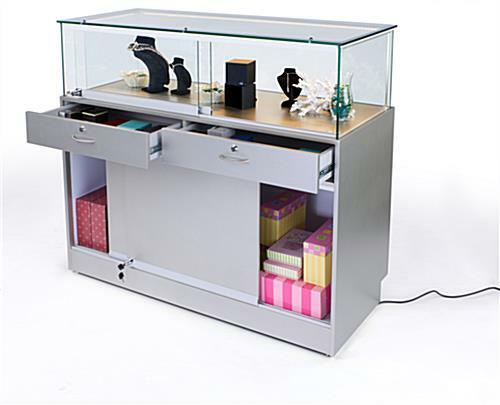 Specialty shops and schools will love how these merchandise case displays, silver display cabinets with built in LED lighting will fit into any environment. Customers will appreciate the taller height because they will not have to bend or stoop to view merchandise or exhibits. 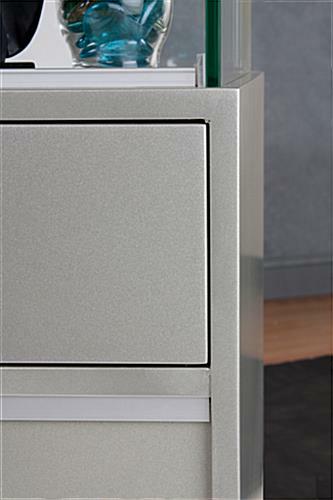 These economical display cabinets ship fully assembled and ready for use and come with (2) keys for access to the locking sliding doors and rear storage cabinets and drawers. 48.0" x 42.0" x 17.5"
23.0" x 19.5" x 18.5"
46.5" x 11.5" x 17.5"
16.0" x 4.5" x 20.8"